The Phillips Norelco 9300 is a premium razor that provides the ideal shave, either wet or dry. This review will cover what you can expect from this razor, what’s included in the box, and the shaving experience it will deliver. This shaver is like the Cadillac of electric razors. It includes a variety of features that will allow you to get the best shave you’ve ever had from an electric razor. The Norelco 9300 is changing the game for electric razors by allowing you to take control of your shave. It features Contour Direct technology to closely follow the contours of the face, V-Track Precision Blades that give you a close shave, the first time. The 9300 allows you to choose from 3-shaving speeds that you can adjust depending on your needs. This model also includes a self-cleaning unit that cleans, lubricates and dries your shaver between uses. An LED display allows you to see exactly how much power you have remaining and will give ample time to charge it when needed. This shaver can be used wet, in the shower or dry, depending on your preferences. The razor itself, more on that later. A user manual which has all the information about how your razor works and how to clean it. You’ll also find a form to order new heads when needed. A registration card which can be used to register your razor online for warranty purposes and reminders to order new blades and foils. Registering your unit also extends your warranty by 6 months and gives you an offer of 50%-off cleaning cartridges. Purchasing this razor comes with a separate precision trimmer in the box. You can attach this unit to the shaver for ease of cleaning up your beard and sideburns. This razor comes with a hard-shell travel case that will protect your unit on the go. It also features ventilation holes to ensure that mold and mildew will not grow on your shaver. The included SmartClean system makes cleaning your razor quick and easy by using cleaning cartridges to ensure the perfect mix of a solution, water and lubricant are used on your razor for each clean. A hair-removal tool that is used for removing stuck-on hairs from your shaver. The included power cord for the 9300 can power either the shaver or the cleaning dock. It also features a multi-voltage adapter so you can use your razor in multiple countries and take it with you while you travel. So Why Choose the Norelco 9300? One of the best features of the 9300 is the contour detect technology which allows the razor to independently move in up to 8-directions for the closest shave possible. This technology hugs the curves of the face and captures up to 20% more hair. The blades in the 9300 are positioned in an ideal way to cut the hair as closely as possible. The blades also self-sharpen to retain their life expectancy. 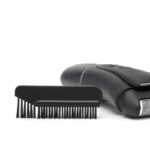 The trimmer is included as a separate accessory from the shaver, so this does mean you will need to remember to pack it as well if you are going on a trip. Although some may feel that having it separated is a disadvantage, it does allow for more precision and ease of use. The LED screen on the razor allows you to track the battery use for the unit. It’s easy to view display features five bars that show you the battery level at a glance. When the fifth bar is no longer blinking, the razor is fully charged and ready to go. The LED display also indicates when it is time to clean the shaver by displaying the cleaning icon. Also, a reminder will be displayed yearly that it’s time to change the blades and foils, so if you see this icon come up, take notice and change your blades for optimal use. A unique feature of this razor is that you can choose from three preset speeds to use. The slowest speed is ideal for those with sensitive skin as it is optimal for reducing friction and irritation. The medium speed on the razor adds only a few extra minutes to the shave time and is great for anyone with normal skin who likes a close shave. The fastest speed will decrease the shave time, but may not be as close of a shave, and may cause more irritation. This is best saved for days when you are in a rush and need a quick shave. This shaver comes with a cleaning unit which helps keep the razor working it’s best. Dried impurities on the blade can decrease the performance and prevent you from getting the best shave possible. The included SmartClean system makes keeping the razor clean both quick and easy. The cleaning dock requires a special cleaning cartridge to be used and replaced as necessary. Using any generic cleaners on the market may void your warranty. To use the SmartClean system, simply insert the cartridge into the dock and press the power button. The cleaning dock not only cleans your razor, but it also lubricates and dries it once done, so it will be ready for the next round. You can also charge your razor in the provided dock, so there is no need to plug and unplug the unit at each use. It uses heat to ensure all impurities are removed and the razor comes out the other side fresh and clean. The cycle is not quick, it can take up to 4-hours to perform all the tasks, and the display on the unit will tell you where you are in the cycle. Don’t start a cleaning cycle if you need to use your razor within the next 4-hours. 1. It’s self-cleaning: the included cleaning dock that comes with the 9300 makes keeping your razor fresh and clean a breeze. 2. The variable speeds: having the option to change the shaving speed will allow you to take control of your shave. 3. Wet or dry shaving: the fact that you can use this as either a wet or dry razor gives you options to personalize your shaving experience. 4. It’s very quiet: a quiet shave means you will not disturb your spouse if you are shaving late at night or early in the morning. 5. Smooth and close shave: this razor delivers a smooth and close shave that limits irritation and friction to the skin. 1. The blade retaining rings are flimsy, so you will have to be careful when you change the blades as not to break one. 2. Detachable trimmer: some may like that the trimmer is detachable, which allows you to use it more precisely, but, some may find this a burden as you will have to remember to bring both items when you travel. 3. It can be difficult to remove the power cord from the charging dock, so if you travel frequently, buying a second power adapter may be a solution. 4. The power cord is very short, so you will need to plug your cleaning dock in close to the outlet. 5. Cleaning cartridges spill easily, so make sure you have your dock in the place you wish for it to reside before adding the cleaning solution. The Phillip Norelco 9300 is a premium razor designed for those who love a close shave, with embedded technology that allows you to personalize your shave. The Contour Detection Technology ensures that the razor follows the curves of your face, for the best shave you can get from an electric shaver. The blades are positioned in an ideal way to grasp the hairs, long and short, and cut them off as close to the skin as possible. The variable speed settings allow you to choose the shave that best suits your needs, slow for sensitive skin, medium for normal skin, and fasts for a quick shave on busy mornings. Once you’re done shaving, the included cleaning system will ensure your razor is clean and fresh for the next go. This razor may not be great for those who are just starting out with an electric shaver, and the price point may deter some, but, it does deliver as it promises and is worth the cost.